Great White Shark Attacks Kayak A survivor tells a chilling tale of what happens when things go really badly. New Kite Section All our kite designs are now in one place with kite spares, carbon and fiberglass rods and kite lines. New Tide Charts Easy to use map for tide times anywhere in New Zealand, includes Muriwai Beach. A great photo series from catching to cleaning, filleting skinning and de boning fish. Check out where we went and see what we caught on our last free fishing trip. More importantly find out how we did it. Catch more snapper and fewer undersized fish! Stop gut hooking! The best fish hook for the fisherman and the fishery! 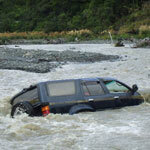 New Zealand weather forecast and swell information. Forecasts for 44 coastal areas. 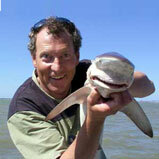 We are adding a shark section to the site, the first article has just been posted. Kite caught. NEW! 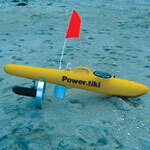 The PT-430 Powertiki Electric Kontiki now has three batteries for more power and longer running times. Winch Available. A beach carts are a great fishing gift idea, sure to please any beach fisherman of surfcaster. Challenge Marine Fishing Torpedo. Massive battery capacity gives five 900 meter sets per charge. 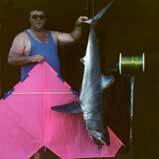 If you don't think kite fishing will work, check out the great kite catches taken by our customers! 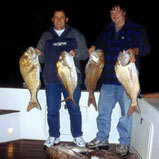 Snapper, kahawai, kingfish, trevally, gurnard, sharks and many more! 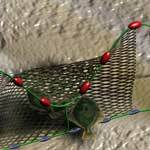 New Article on the cause and remedy of tangled traces. 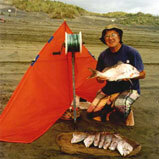 Kite fishing is the ultimate in surf fishing equipment. 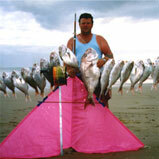 We combine top of the line kites with the best surf fishing rigs. 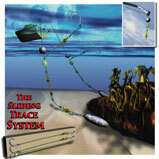 Everything is here from surf fishing basics and tips right through to how to make your own saltwater rigs and tackle. New fishing knots including hook knots, these fishing line knots are stronger and more reliable. 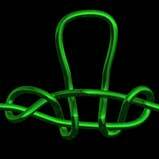 If you don't know how to tie knots our knot tying tutorial each with a 3D knot tying illustration makes knot tying easy. Make sure you have the latest information on where the fish are biting right now, get the latest free fishing reports to find the best place to longline or kite and kon tiki fish this weekend. Subscribe Here for you free catch reports and special subscriber offers!